Dante's View provides a spectacular look at Death Valley's remarkable scenery. From this vantage point you can view distant 11049 ft. Telescope Peak to Badwater, the lowest point (-282 ft.) in the Western Hemisphere. This difference in elevation is a staggering 11,331 feet (3455 m) — the greatest topographic relief in the conterminous U.S.. This striking topography is a product of Death Valley's very active tectonics. 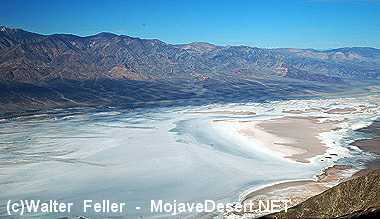 Death Valley National Park lies in one of the youngest and most active parts of the Basin and Range province. The term "Basin and Range" is taken from the unique character of this province's landscape. Here, steep, elongate mountain ranges alternate with flat, arid, desert valleys in a pattern that extends from eastern California to central Utah, and from southern Idaho into the state of Sonora in Mexico. The forces that created this distinctive topography begin deep beneath the Earth's surface. Tension created by movements of Earth's tectonic plates have stretched the rocky crust Basin and Range province to the breaking point. The entire region has been pulled apart, fracturing the crust and creating large faults. Along these roughly north-south-trending faults mountains have uplifted and valleys down-dropped, producing the distinctive alternating pattern of linear mountain ranges and valleys of the Basin and Range province. 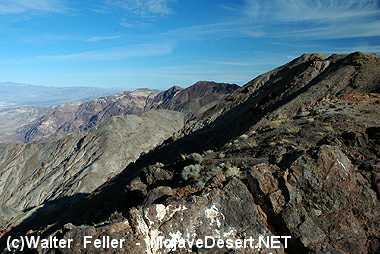 Dante's View is a perfect place to see the results of Death Valley's very active fault system. The steep mountain face on which you are standing rose up along the fault while the valley floor descended. The deep Death Valley basin is filled with sediments eroded from the surrounding mountains. 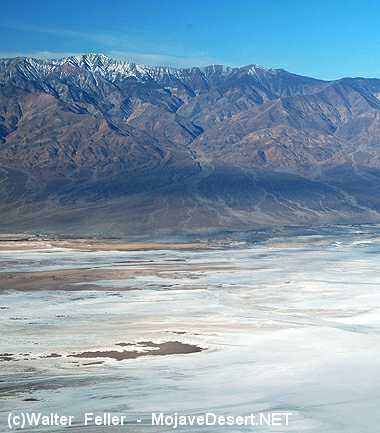 Striking topography; 11049 ft. Telescope Peak to Badwater, the lowest point (-282 ft.) in the Western Hemisphere. This difference in elevation is a staggering 11,331 feet (3455 m) — the greatest topographic relief in the conterminous U.S. The deep Death Valley basin is filled with sediment eroded from the surrounding mountains. The western face of Dante's peak shows the abrupt result of Death Valley's tectonics.